It's no secret that many national retail chains are struggling to keep up with the growing threat from e-commerce sites. With 77 percent of Americans now owning a smartphone, the shift towards mobile and online purchasing will only increase. Luke Wilwerding, director of retail solutions at Elo, shares how two retailers integrated in-store digital signage for personalized/assisted selling. It's no secret that many national retail chains are struggling to keep up with the growing threat from e-commerce sites. And with 77 percent of Americans now owning a smartphone, the shift towards mobile and online purchasing will only increase. So far in 2017, we've seen such retail giants as Sears, The Limited, JCPenney and American Apparel close stores, or in extreme cases, shutter their brick-and-mortar presence entirely. With e-commerce options literally at their fingertips, shoppers are choosing with their dollars where they complete purchases – and if a retailer doesn't create a satisfactory customer experience, including in-store e-commerce options, shoppers will take their wallets elsewhere. New York & Company is one national retailer that is converging online and in-store selling by introducing self-service kiosks in select stores throughout the U.S. Serving as a complement to the store associates and traditional checkout area, the kiosks are positioned throughout the store or near the service desk. This gives shoppers the choice of self-service by providing multiple touchpoints throughout the store where they can shop both the store’s physical and online product offering, make a secure purchase and ship their order directly to any address. New York & Company captures all possible sales, expands their point of sale capabilities and gives customers tech options that they are beginning to expect and intuitively already know how to use. Luxury and smaller boutique retailers are also finding ways to benefit from using interactive technologies in-store. Monica Rich Kosann, a luxury retail jeweler, is using touchscreens at its freestanding location in The Shops at Columbus Circle for their own take on the "white glove" shopping experience. To maximize the availability of their inventory beyond what is in their shop, the sales associates use the screens for personalized assisted selling, where they can comfortably show shoppers the full line of jewelry and demonstrate how different pieces, such as their signature keepsake lockets, can be customized. As these two examples show, retailers of all sizes can benefit from using interactive technologies in-store. But it's not a one-size-fits-all approach, and what type of technology a store should incorporate depends on the type of store, its product offerings and what its customers are looking for in a shopping experience. For the retailer looking to create an omnichannel shopping environment, self-service kiosks allow shoppers to choose an online option while they're already in your store. This can help prevent a loss of sale if a location is out of stock of an item, while still giving the store credit for that particular sale. Offering ship to store, home or office options also continues to converge online and in-store channels while giving customers more choice on how they shop a brand. But not all retailers necessarily need a kiosk installment. They can be a significant cost investment, and smaller retailers and boutiques can equally benefit from using digital signage with point of sale capabilities. 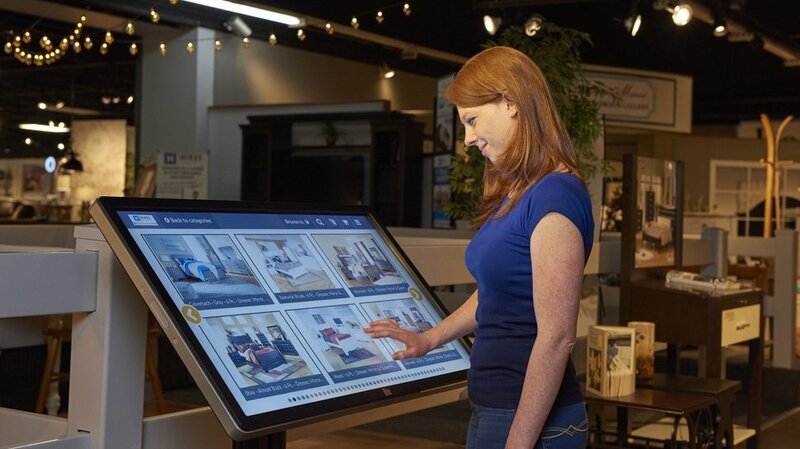 These touchscreens can range from a tablet size up to 70+ inches depending on the needs of the retailer. By doubling as both signage – that broadcasts beautiful, interactive imagery or dynamic pricing/promotions – and a place to deploy a website, retailers get more bang for their buck while still giving their shoppers the in-store technology options they crave. Do I have limited space to display my inventory, but a large product offering? Would it benefit my customers to be able to make online purchases in store? Do I have a well-designed website that would enhance the in-store experience? What size signage will best display my website or product offerings? Where else can I incorporate point of sale capabilities? Would my sales associates benefit from being able to carry, or easily move, my digital signage? These questions are a good starting point to think strategically about how to stand out from the crowd and impress customers. Retailers should expect to see their competitors starting to incorporate tech solutions, so the time is now.